Mac/WinAPRS and XAPRS APRS software from the Sproul brothers. To my knowledge it is no longer under active developement. I still use it from time to time. NWS Shape Files For use with WinAPRS. This will allow you to view the watches and warnings as they get to you via the internet or RF. Warning, it is an 18 meg download so give it some time. Bill Diaz, KC9XG. Bill has produced many controbutions to APRS over the years. He actively assists in the software that allows UI-View to work with Precision Mapping Maps. APRS+SA From Brent Hildrbrant, KH2Z, uses Street Atlas version 4.0 and up for the map base. dosAPRS This is Bob's version and the first. Xastir A Linux version of APRS software. I use Xastir as my current APRS software of choice. Xastir supports downloading mapping from OpenStreet Maps. Visit the other links at this site as well. Future projects in Amateur Radio frequently start here as a presentation that someone has been working on. a GPS display for adding to a tracker. HH2 has run its life, HH3 is in develpoment. This is going to be a really neat project and TAPR will be helping out when it is ready for kit form. Steve and his develpoment team have done a great job on this. A source on the connector used on Garmin GPS receivers. My geocaching stats as of 8.18.2010. Visit geocaching.com for more information. JPEG of my finds. I suggest using the gps file in Google Earth so you can move around. I currently use my Garmin nuvi205w and GPSMap 60CSx for geocaching. My 60 CSx is my new receiver and it buries my 76. I have had my 76 since 2001 and it is a great receiver but the sun has given it a beating over the years, (alot of time in the dash cradle) and is loosing contrast on the display. The 60CSx also has a greatly improved receiver. We are taking about a day and night compairison on birds heard. The nuvi is used to get to the general location but is not very good at getting my close to the end location. My 76 has performed, or I thought atleast, pretty good until I saw how my son's eTrex Legend was doing on receiption. The 76 was still good enough but I feel like it added to my work on finding caches. One item that the 60CSx has that the 76 does not is position averaging. This will be handy when I place caches that are under tree cover. GIMP's home page. If you like graphics manipulation, you are gonna love GIMP. GIMP for Windows. I play with GIMP on both the Linux and Windows. Wx at WB5NZV-8 for the last 24 hours. Located in Denton Texas. Wx at W5NGU-3 Is currently out of serivce. I do not have a ETA on when this will return to service. 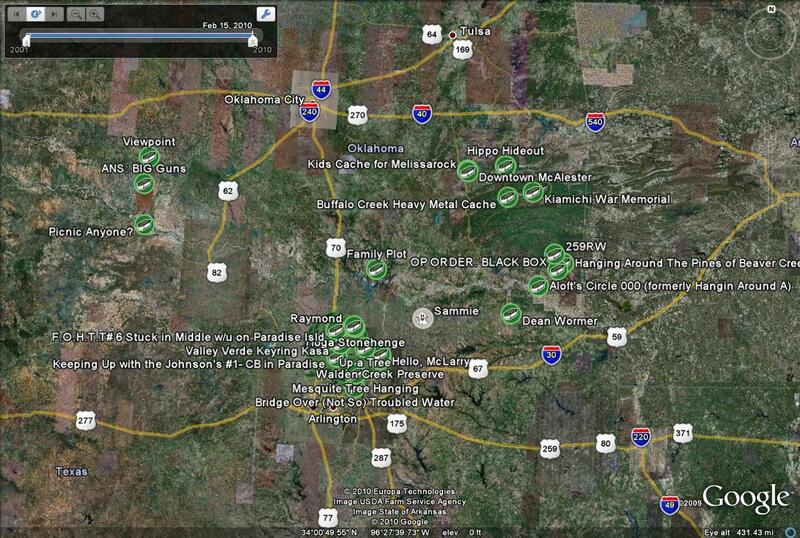 To see weather stations in the DFW area,click here. Weather in the DFW area. I can not begin to express my concern that if you participate in Skywarn or storm spotting as a hobby to do it safely. The NWS has on more than one occasion and in Skywarn classes discussed why you need to be safe and why hidding under an overpass is a VERY BAD idea. Please refer to the following article. Here is a link that details what happens and why you do not want to be in an overpass when this happens.http://www.srh.noaa.gov/oun/papers/overpass.html As a hobbiest or a trained spotter, there is no excuse for unsafe activity. It can get you hurt or killed and reflects badly on Skywarn actvities if a person gets hurt, damages property, or gets killed due to unsafe actions. If we want to keep the public safe from bad weather, then we have to play it safe as well. I am not a Linux guru by any shape, form or fashion of the word. I had to get some serious help from a local friend of mine to get my server to handle dial on demand for my lan back in the late 1990s. I am on Fios now. Theses are some links that I have visited. If you have a site or know of a site that has good help or topics, email me and I may add it. Ubuntu This is now my favorite version of Linux. I have a Dell Inspiron E1505 that was setup to run Ubuntu, or so Dell claimed in June 2007. I am currently using 10.04. You can boot Ubuntu as a live cd so you can play with it without trashing Windows and even use it for recovery like I did with Knoppix in 2007 on my wifes laptop. I have used it for data recovery on multiple laptops that started to have hard drives go bad. Knoppix I have used this version of Linux to obtain the data from systems that the HD has gone south in. My wife's Dell tanked a portion if its HD in the middle of the area that system32 was in. You could not boot XP. Booting from Knoppix let me copy her entire Documents and Settings directory to a thumb drive so I could copy it over to the new hd after replacing it and installing XP. I now use Ubuntu just to to frequency of use. Both are Debian based and I recommend either one. Linux Journal I have a subscription to LJ and love it. Check out the regularly release tech help videos. Take a glance at the Comments I have sent to the FCC over the years. If you place a high value on the status of Amateur Radio, then filing comments should be a priority to you. The current and future state of our hobby is dependant on the process the FCC goes through. The best way to view comments is the perspective of voting. Each comment filed is more or less a vote. You can state your opinions and facts in the comments. The FCC does read them. Letting the ARRL, TAPR or some other group is strictly not enought effort. The comments that the ARRL and TAPR have filed do carry weight, but not enought on their own. Your comments to rule makings or rule clearafication request is vital. They determine to road that Amateur Radio follows. The commercial industry (Part 15) knows this full and well. Part 15 manufactures use the reply and comment phases to their advantage and it shows. The best example is microwave allocations. We have lost a tremendous amount of spectrum to Part 15 because Part 15 presented a better case than Amateur Radio. The same principle applies to changes with our hobby as apply to voting. If you did not vote, you do not have the right to complain. N8UR's technical topics. I strongly urge you view John's site. John has and currently is an author of books for TAPR. Several years back I found a newsgroup post that explains the use and application of the decibel. I scanned in the document since I could not locate the floppy I saved it to. There may be some formating or spelling errors but the math and overall information is valid. Effects of VSWR on transmitted power article. Antennex.com. 1/4 wave antenna, When is a 1/4 wave not a 1/4 wave?. 1/4 wave antenna, a cheap source for 12 volt 40 amp power supplies . Using a pc supply can give you a cheaper source for 12 volts that runs cool and quiet. I suggest the use of 200 watt supplies or higher. 1/4 wave antenna, DDRR antenna.